A couple of weeks ago when I toured my 39 W westwards I ended up at a meet for military vehicles. While there I meet a fellow NVMC (Norwegian Vintage Motorcycle Club)member, Lars Jan. 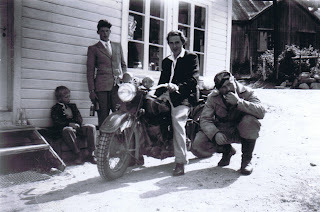 He was obviously a guy with several hats as I only knew him as a keen motorcyclist, either by Velocette or Indian 101, now touring a Willys jeep. We soon came to discuss old motorcycle photos (surprise-surprise). The other day I got the excellent photo below in an e-mail from Lars Jan. This late thirties Indian Sports Scout had its heydays in the Stavanger area. Thanks a lot, big smile! A pair of amber spotlights on handlebars are a cool detail I`ve never seen before.